Crafting impressive pieces for homes is what we aim to do. This home in the East part of Mesa Arizona wanted to use the majority of their high entry way. Our iron technicians are experienced with crafting custom designs specifically for your needs. Whether you have space you want to fill like this home in East Mesa, or you want to replace the door you have, we will make the iron door perfect for you. 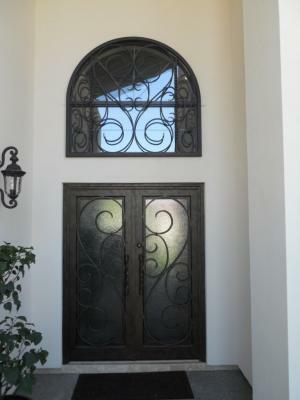 Call us and come visit our showroom in Phoenix Arizona to meet with our sales team and discuss your iron door possibilities.